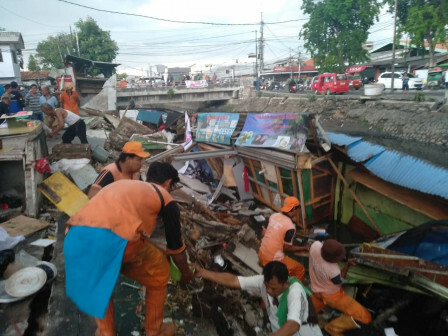 The collapsed buildings cleaning on the Tubagus Angke riverbank, Jalan Jembatan Gambang Raya, RT 19/01, Pejagalan Urban Village, Penjaringan, North Jakarta is targeted to be finished today.
" These six buildings are consisting of food stall, grocery stall, and photocopy"
It is conducted by involving personnel of Satpol PP, Water Resources Sub-dept., and PPSU. Pejagalan Urban Village Head, Yogara Fernandes stated that the buildings were collapsed, as the sheetpile experienced a collapse. Of the total eight buildings, six of them collapsed and fell into the river. "These six buildings are consisting of food stall, grocery stall, and photocopy stall," he expressed, Wednesday (10/24). The collapse occurred at around 4.15 PM, Tuesday (10/23). Fortunately there were no fatalities and casualties in the incident. The collapse location is ex-PKL temporary location that was deleted in 2014. Totally there are 15 buildings along the location. "We urge other traders to empty the building and coordinate with SDA to make improvements. Our cleaning target is completed today," he said.